If you are going to run a company around a slogan like “Tell Great Stories,” or rally your troops by adopting the Native American proverb “Those who tell the stories rule the world,” then it pays to build an environment that fosters great writing. Large photographs of your favorite writers covering one wall is appropriate. As is a collection of your favorite books along another wall. And that’s just the environment Shane Snow has created for the employees of his company. Shane is the co-founder of Contently, a high-end brand publishing firm. In fewer than five years, Contently has courted the likes of Coca-Cola, GE, Walmart, and Google as clients, providing both software and creative talent to help satisfy media objectives. By trade, Shane is a journalist. He has written for Wired, Mashable, and Fast Company and occasionally contributes to publications like the Washington Post, The New Yorker, and New Scientist. He received his master’s degree from Columbia University’s Graduate School of Journalism and is a Fellow of the Royal Society of Arts. He has also been invited to speak at Columbia University, SXSWi, BlogWorld, Social Media Week, and Search Marketing Expo, among others. In 2012, Shane made Inc. Magazine’s 30 Under 30 and the Silicon Alley 100 Coolest People In New York Tech lists. And let’s not forget that he was valedictorian and class president at Bonneville High School in Idaho. Naturally, he’s not one to squander time. Shane moved to New York City in the back half of the last decade to rub shoulders with some amazing tech editors. In the bargain, he hobnobbed with some severely ambitious people — entrepreneurs who accomplished a lot in a short amount of time. These business owners had a profound influence on Shane. So, in 2010, he decided to become an entrepreneur himself. Enter Contently — a business with a mission of “building a better media world for publishers, creators, and consumers.” And if that wasn’t enough, Shane also wrote a book while running his fast-growing company. It’s called Smartcuts: How Hackers, Innovators, and Icons Accelerate Success (released September 9, 2014). I think it’s safe to say that Shane is a model and inspiration for those of us who want to build a career or business around publishing online. Reading his story can easily arouse a little ambition. But lest you think Shane is all work and no play, take a peek behind the curtain to discover how he relaxes, his unorthodox hiding method (so he can write), which two dead writers he’d love to have dinner with, and more. I’m Shane. By day, I help run Contently, which I co-founded in 2010. By night, I attempt to commit journalism and, occasionally, urban exploration. In descending order: Technology. Business. Media. Science. Pizza. I spend more time reading than probably anything else. Unfortunately, most of it’s email. I try to read something every night before bed, and I’m always reading while on the train. Research happens in bursts. Or on neurotic impulse, like when you decide you need to know now how they get the caffeine out of tea to make decaf. I usually try to find a place where I can be alone. Sometimes in public is the best place to hide. I also try to write immediately after exercising, as I find some of my best ideas pop out then. I listen to a single song on repeat over and over again to simultaneously create psychological movement and white noise. Currently, I’m about 500 plays into Timbaland’s “The Way I Are” and am considering finding a new track. How many hours per day do you spend writing (excluding email, social media, etc.)? 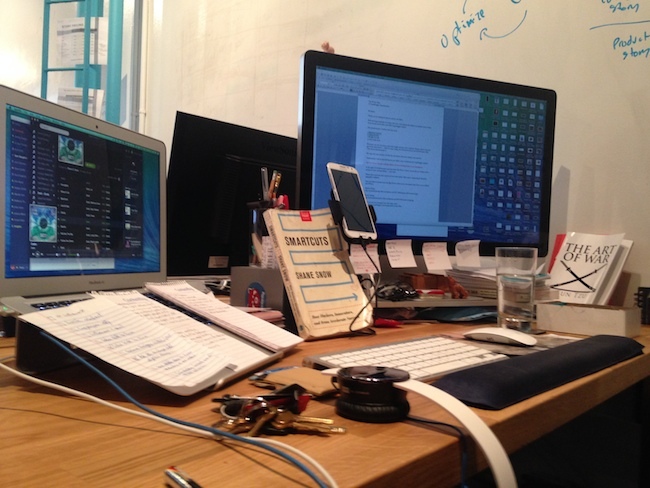 When is your most productive time of day? Between two and 20 hours, depending on the day. Usually early morning or late night. Or late night turning into early morning. 8:00 a.m, and every evening from 8:00 p.m. to 12:00 a.m. for 12 months. Otherwise, I usually just schedule a few hours depending on the writing project. Saturday is almost always a marathon writing day. I haven’t experienced it. But I also write nonfiction. The story is already there. You just need to find it and tell it. Fiction seems really hard. Jon Ronson’s writing makes me so jealous I want to quit. And I would kill to have lunch with Oscar Wilde. I’m jealous of writers who have distinct voices. I’d like to develop that. Ryan Gosling. Okay, that’s a joke. But I like the guy. 1,000 words in what feels like 10 seconds, or 100,000 words in 30 seconds. There are about seven antique typewriters laying around my house right now. All seafoam green. But I write on various Mac devices. No. Though I hear amphetamines help. Too scared to find out. Deadlines are sacred, so I try to file early whenever possible. My favorite system for reporting is to record interviews in Rev (in-app or upload to Rev.com), which sends audio out for automatic transcription, and then to beam that directly into Evernote. When I write notes, I make little checkboxes next to action items that occur to me during a meeting. I periodically go through my notebooks and check off the boxes, usually when it’s way too late. I had a high school teacher named Mr. Lemons who cared so much that it had a really big impact on me. When his wife got cancer, he shaved his head so they could be bald together. Everyone should love people the way that guy did. What do you view as your greatest success in life? Being a good person. Hopefully I’m not failing too badly at that. Editors who assign stories and then don’t get back to you for months after you file. Makes me want to lose my mind. And yes, this is happening to me right now. Oh man, I said this already. But I’m going to use this as an excuse to pick a second: Douglas Adams. That would be an amazing dinner. I’d probably go back to O’ahu, where I used to live. Go surf with friends, then for a swim at Cockroach Cove. Read as much as you possibly can when you’re young. Every serious writer builds a shrine of some sort with which he hopes to entertain the Muse, whether it entails selecting the perfect table at a coffee shop or carving out a quiet nook in his home. Shane’s just happens to be out in the open — with a well-worn and used appearance. This is where he has poured out the sweat, blood, and tears to run a business and publish a book. And we are grateful. Many thanks go to Shane for taking time out of his busy schedule to find the words! 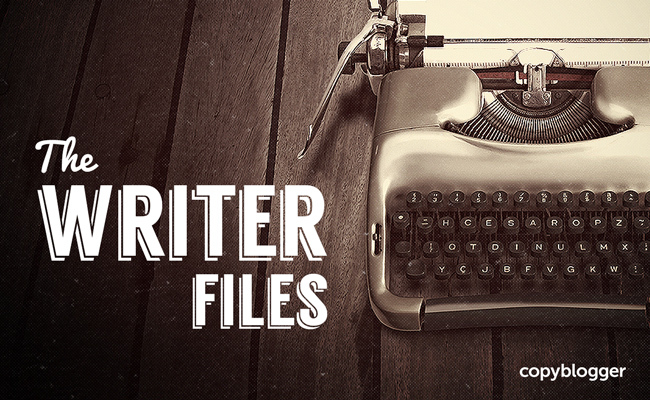 Check out The Writer Files archives. If you’ve already subscribed to Copyblogger via email or RSS, the next installment will be delivered to you just like the rest of our content. If not, go ahead and subscribe right now so you don’t miss a post. And if you’d like to join in the discussion about our featured writer Shane Snow, head over to Google+. Previous article: Which of These New WordPress Themes is Right For Your Audience?